Do you need a tasty and beautiful sweet treat to serve at a fall dinner or party? Do you have an abundance of apples? If yes, then you’re in luck, but even if you have neither, make this tart! I have almost endless inspiration for how to use up my over-sized apple haul, so, when I found myself in the supermarket with only $5 (I had intended to buy one item) and a choice between buying orange juice to make a Jewish apple cake and puff pastry to make this tart, I placed an emergency call to David to get his expert recommendation. He went for the tart, and I am so, so glad he did. The tart’s crisp, buttery crust is topped with soft, sweet apples and brushed with a salted caramel glaze. 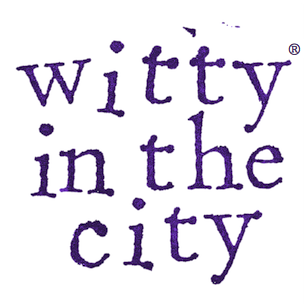 The resulting flavor combination is blissfully seasonal. To make this tart, defrost a sheet of frozen puff pastry in the refrigerator until it is pliable. Pre-heat your oven to 400º F, and then tear off a sheet of parchment paper that is the size of a baking sheet. 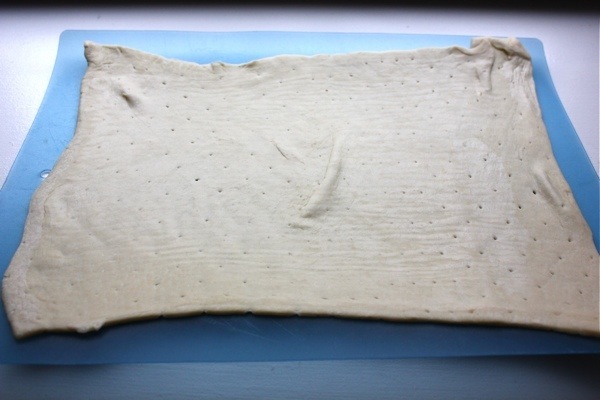 Put the parchment paper onto a flat surface, and lay the puff pastry onto the parchment paper. Lightly flour the top of the puff pastry and a rolling pin, and then roll the pastry out to the size of your baking sheet or as thinly as you can. Transfer the parchment paper and puff pastry to the baking sheet, and set it to chill in the fridge while you prepare your apples. The amount of apples this tart will use depends on how large your sheet of puff pastry is and how closely you layer the apples on. I used 2+ very large apples, but I’d recommend prepping the apples as you go so you don’t end up with more slices than you need. 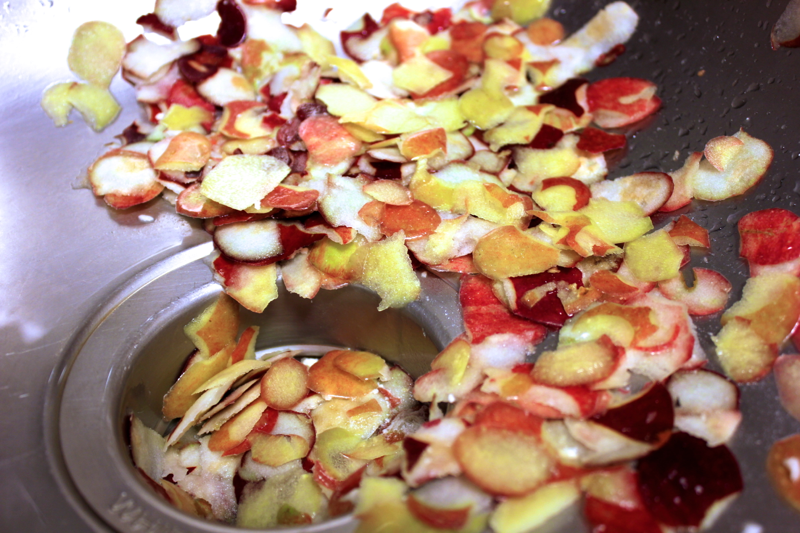 So, peel one apple, cut it in half from top to bottom, and remove the stem and the seeds. 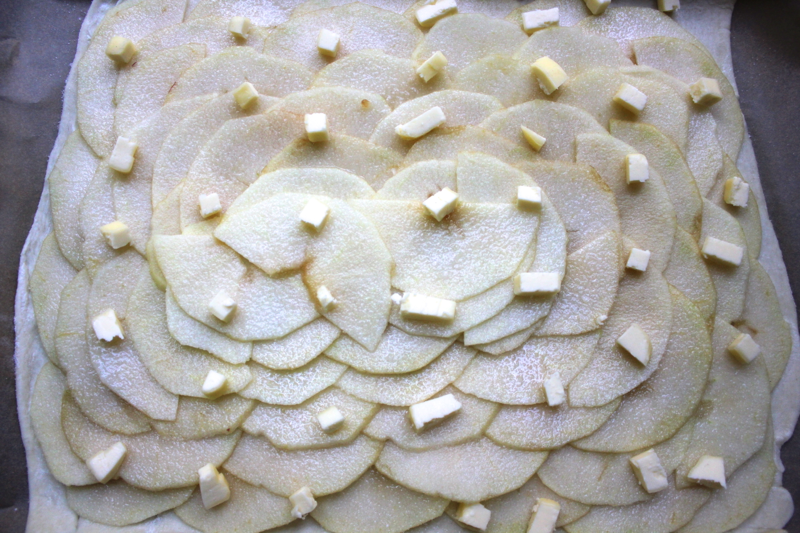 Use a mandoline to slice the apple halves cross-wise into pieces 1/16th of an inch thick. As for apple variety, any type that you enjoy eating will do. 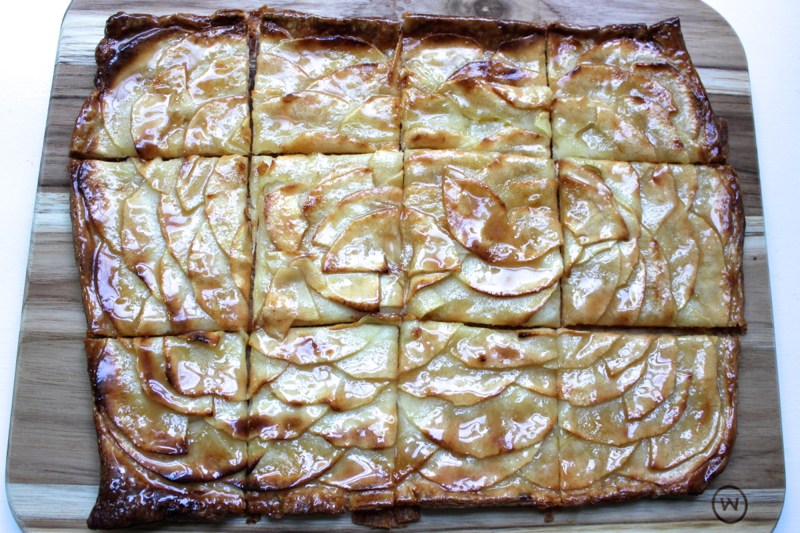 Layer the apples slices on the puff pastry around its perimeter, leaving just a small crust. Then, layer more apple slices just inside the first ring of apples, overlapping them so that only 1/4 inch of the first apples stick out. 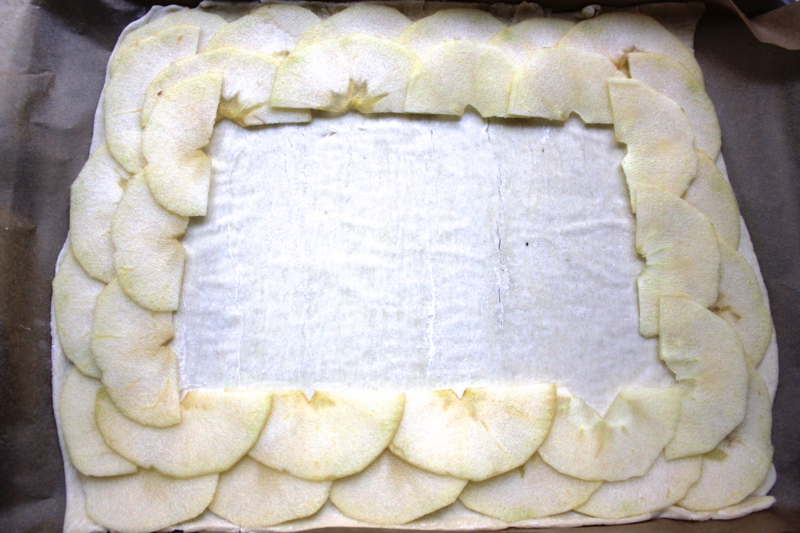 Continue filling in the pastry with the apple slices, cutting more apples as you need them. Once the entire puff pastry is covered with apples, sprinkle over 2 tablespoons of sugar and 2 tablespoons of cubed, cold butter. 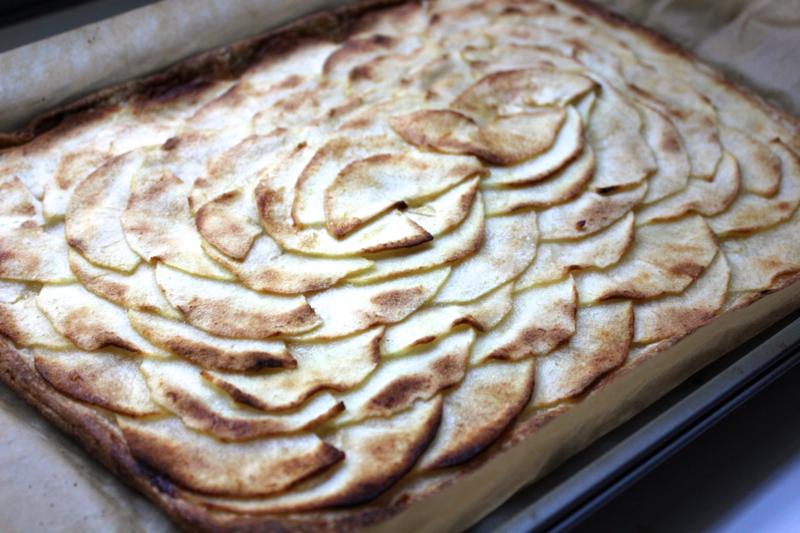 Bake the apple tart for 25-30 minutes, rotating the baking sheet around half-way through for even browning. While the apple tart bakes, prepare the caramel glaze. To a small pot, add 1/4 cup of sugar and a splash of water. Bring the water and sugar to a boil, swirling the pot around occasionally to keep things moving. Don’t stick a spoon into the sugar while it is caramelizing or you may cause it to crystallize. As the water evaporates from the pot, the bubbles in the sugar will get smaller and smaller until all of the water is gone. Then, the sugar will begin to brown. 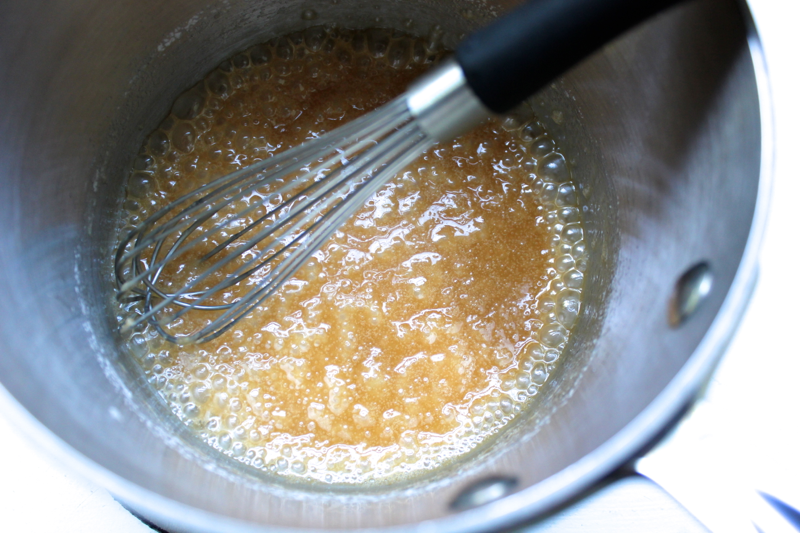 As soon as the sugar turns a golden shade of honey, remove the pot from the heat, and add in 2 tablespoons of butter. I used a salted, cultured butter that my friend made. If you’re using unsalted butter, throw in a small pinch of salt as well. Continue swirling the pot until the butter is melted, and then pour in 2 tablespoons of cream (or milk, which I used because I was out of cream and didn’t feel like heading back out to the market). Use a whisk to combine the cream into the caramel, heating it over a very low flame until the caramel takes on a smooth consistency. 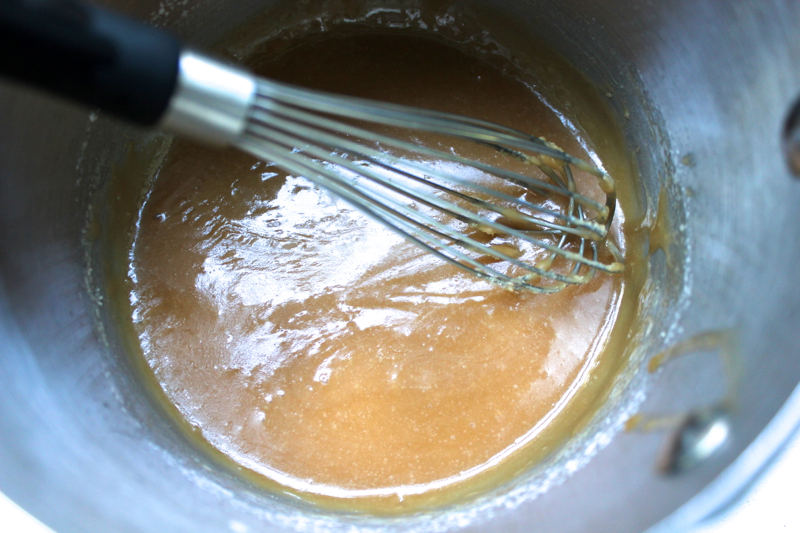 Don’t be afraid to attempt the caramel glaze- the worst that can happen is that you’ll burn 1/4 cup of sugar, and you can always default to a store-bought caramel sauce if need be. 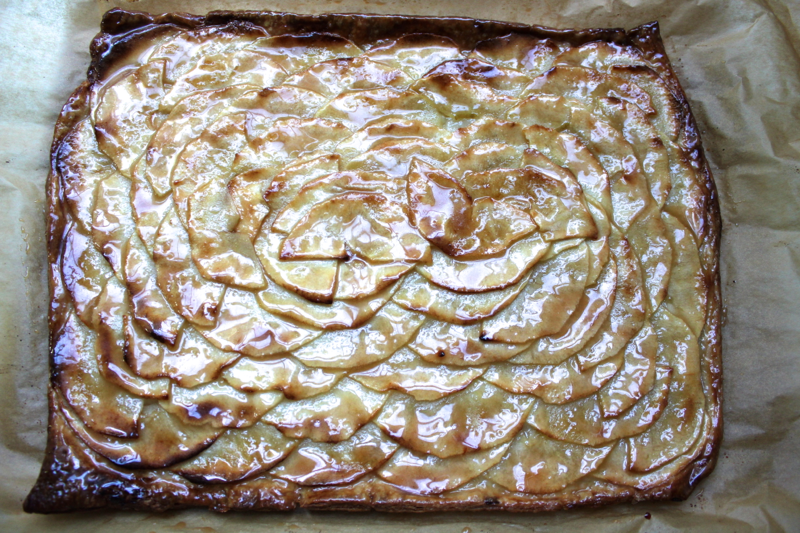 When the apple tart is finished baking, use a pastry brush to dab the caramel over the apples and any exposed crust. Be careful not to brush the apples too vigorously or else they will shift out of their beautiful pattern. If the caramel hardens before the tart is ready to be brushed, you can whisk it over a low flame until it liquefies again. 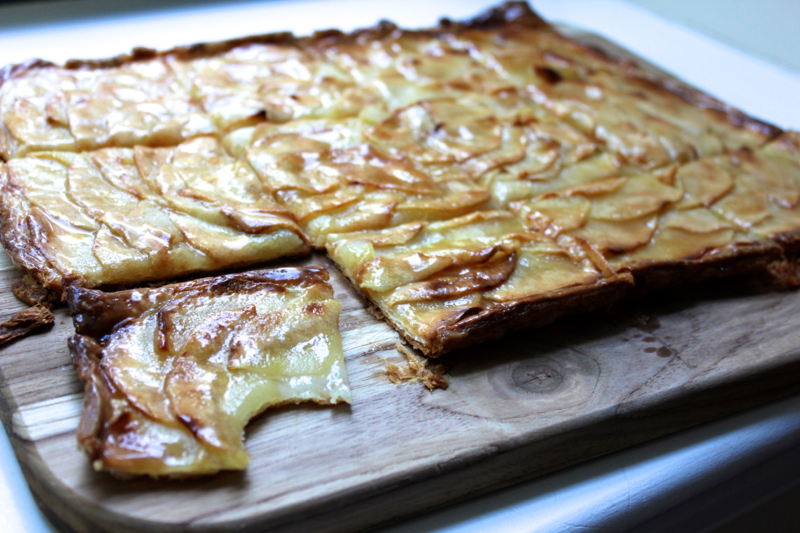 Transfer the apple tart to a cutting board, and use a sharp knife to cut it into pieces. Don’t drag your knife through the tart or else the apples will shift around, so use your knife to press down on your tart rather than saw through it. Although I doubt you’ll be able to resist it for longer, this tart is best eaten within a few hours for maximum crispness. I really love this tart. Would anyone like to participate in an over/under for how much time will pass before I make another? I’m thinking 3 days is a good starting point. Looking forward to biting into this luscious looking tart. Waiting———! Ur recipes r without a doubt phenomenal!!!!! What a cook, baker, & photographer!!! I agree with mammy. You’re the best! I made this yesterday and it’s all gone! Too good!!! I must make another one very soon. Delicious and so easy to prepare!